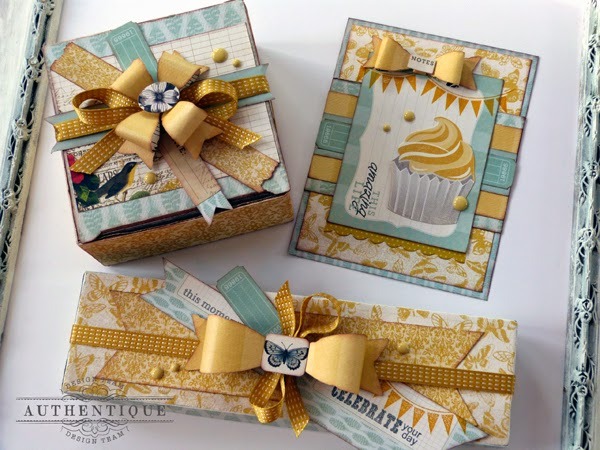 Hi everyone, it's Audrey, here today with a fun gift set to share with you featuring the beautiful Harmony collection, as well as a few tips and ideas for using the new Authentic Life Cards. I love pretty packaging, and creating matching gift boxes and greeting cards for special occasions is one of my favorite things to do. 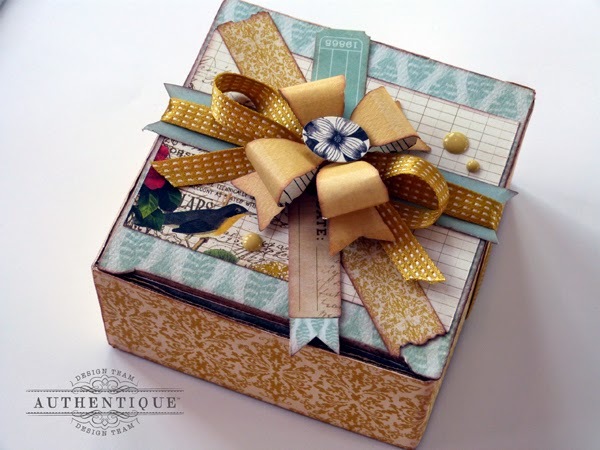 It really is simple to add paper and ribbon to a plain old gift box, and dress them with matching accessories to fit whatever theme or style suits you. Your friends and family will love all the extra "effort" you went to, and you will love how easy it truly is. This sweet gift set using the Harmony collection is tailor-made for my friend's upcoming birthday. The colors are so her. I stuck with yellow and blue prints here in her favorite color palette, and added similar elements throughout to keep things uniform. 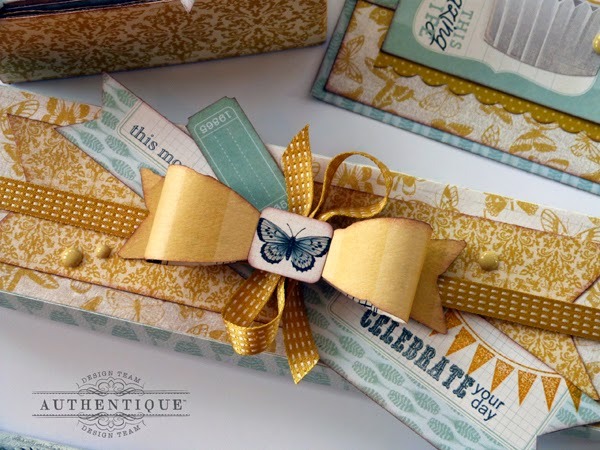 Die cut bows and ticket stubs, candy dots and hand-stamped banners. I also threw in several of the fabulous new Authentic Life Cards, with a few different ways of using them. Try using the Authentic Life Cards as an eye catching background, like I did here with this first box. The pretty bird and floral design in the bottom corner adds a ton of interest to the lid of the box without detracting from the big bow on top. Many of the cards have fun images like this to take advantage of, and don't forget to check out both sides of these double-sided cards for even more options. You can also cut the Authentic Life cards apart to create other unique embellishments, like the two banner flags I added to either side of this second bow. It's so easy. Simply cut the card into two or more pieces, then trim a v-notch into one end. Add stickers or stamp images, like my banners and birthday sentiment. Punch a small hole at the top to thread with hemp or string to use them like tags. Or just adhere them as-is, like I've done here. The Authentic Life Cards also make awesome frames for focal images, like on my card here. The pre-printed sentiment on this card makes a perfect instant greeting, too. Love it when these cards do double duty like that. 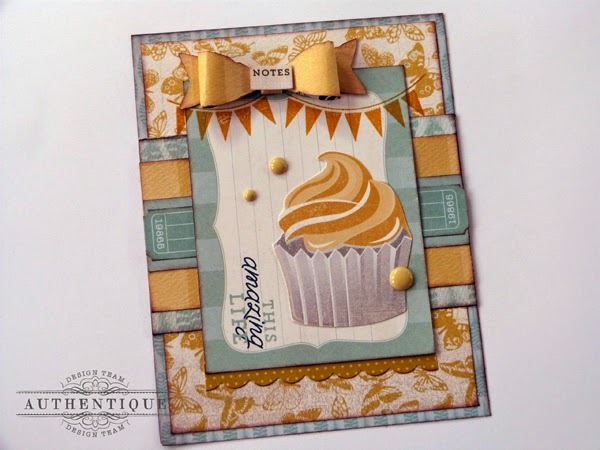 And by the way, that adorable cupcake is from one of our previous collections, Wishes. I just fussy cut the image from one of the 12x12 papers and added it to the frame. I think it is the perfect match. 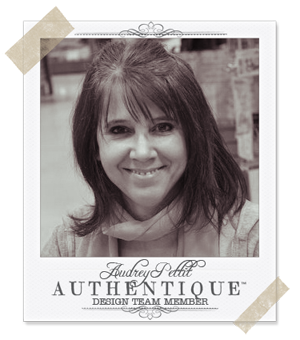 Hope I've given you a few fun ideas for using the new Authentic Life Cards and the brand new beautiful Harmony collection. Enjoy! "awakening" 12x12 paper"zest" 12x12 paper"song" 12x12 paper"growth" 12x12 paper6x6 "bundle"
I am SUCH a big fan of Audrey's....just LOVE her style. These projects are absolutely wonderful. Gorgeous colors & details! Gorgeous once again! Beautiful details! Great projects!!! love it!! Those bows are awesome!! I'd use these in cards and scrapbook layouts! So versatile! What beautiful projects! So excited about these gorgeous journal cards! I love using them on cards, tags and banners! I love the colors. The blue and gold mingle together so prettily. I'd use the cards for my greeting cards. I don't do a lot of scrapbooking so they'd work well in the cards. Thanks for a chance to win them. These projects are so amazing! LOVE them! I would use on mixed media layouts! I'd use them for tags and mini albums...very pretty projects! I would use them to make cards for our church card ministry. Both t he card and the boxes are really beautiful. I love the colour combo and the pretty bows! I love Authentique products and style! I love what you've shared here, so pretty! The cards look great on the card, but would also use them on my layouts! Beautiful projects! I really love the colors! I'd use it for cards and ATCs! Gorgeous! I especially love Audrey's bows! Wow!! I saw this set on FB and wow!! Stunning & Beautiful! I actually used a few cards. Gave them to my coworker who was having a bad day and she put them up around her desk. She loved the sayings. 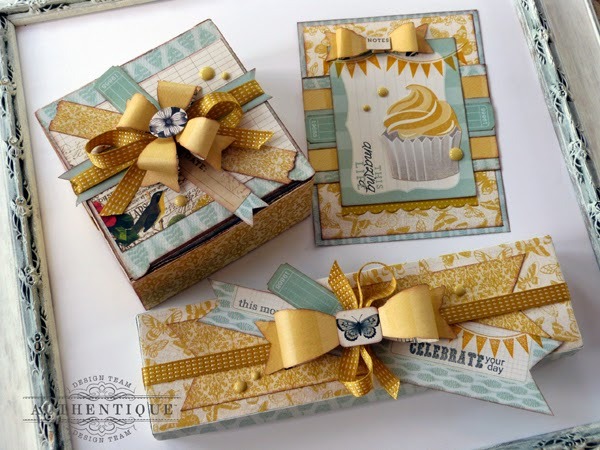 Gorgeous projects, love the way the Life cards were used! I would use them on cards and layouts. Beautiful! Everything looks so wonderful! I would use these for cards, scrapbook layouts and my mixed media projects! I would use my life cards like you used yours today. I think they look great on cards, packages, gift bags and mixed media. They are so versible and that is why everyone loves them so much. Such great projects! I would used them to give away with gifts!! Love that style, everything is so beautiful! What a stunning colour combination - and what gorgeous gifts. I would use these cards on my scrapbook layouts. The boxes are gorgeous! and I love the color mix, you can't go wrong with yellow. Wow, so gorgeous!! I love to make cards and would love to win this set. Thanks for the chance. Darling....I would use them in an 'Inspiration' mini album! Love how these would work with the cards I make!! Thanks for the chance to win!!! Oh my, I am loving it all. I would use them on cards and layouts. Thanks for all the inspiration and the chance to win! Wow! These are such beautiful projects and I would definitely use these on my scrapbook projects.